Cost to maintain and mow the lawn varies greatly by region (and even by zip code). Get free estimates from lawn care and gardening professionals in your city. Cost to maintain and mow the lawn varies greatly by region (and even by zip code). The average cost of mainting and mowing the lawn is $75 - $100​ per visit. How much does it cost to maintain and mow the lawn? A manicured lawn is healthy and can instantly improve your home’s curb appeal. While many people mow and maintain their own lawns, hiring a service is another popular option. For this example, we’ll consider the cost of maintaining an average 8,000 sq.ft. lawn, which averages $75-$100 for a standard maintenance visit. A typical lawn maintenance visit costs $50-$75 for an 8,000 square foot lawn. Although services vary depending on providers, they typically include mowing, edging, trimming, and debris removal. Most providers charge a flat fee per service instead of charging by the hour; however, if work is over the typical threshold, some providers charge an hourly rate of $65 on average. If you want your lawn clippings bagged, expect to add an extra $5-$10 to the overall cost. Using a leaf or air blower to remove debris from the lawn or patio areas can add another $75-$100 depending on the size of the area. Some lawn services also provide pest control and the price averages $250-$300 but can vary based on the type of pest and the nature of the problem. Weeding the lawn can add an extra $50 to your costs, depending on how many weeds are in the lawn. If there are a lot of weeds, some companies may charge per hour to remove them all. Together with the fertilizer, most lawn maintenance companies offer a weed treatment. Applying herbicides will add approximately $40-$90 to the overall cost. Lawn aeration 2 costs $120-$150 on average and should be done two to three times per year. Adding mulch 3 to your maintenance visit will add an extra $50 to your costs. To install new landscape edging with materials such as brick, plastic, concrete, wood or stone may be a beautiful addition to your garden and it will cost around $400-$700. Many lawn companies offer discounts if you schedule regular visits, such as a weekly or bi-weekly mowing. Some companies also offer discounts if neighbors sign up for service on the same day. Some towns and neighborhoods limit the types of fertilizers and chemicals that can be used on lawns; check with your local community officials to see if there are restrictions in your area. If winter is coming, you may consider winterizing your lawn so that it doesn’t die whenever there is a snowfall. On average, winterizing your garden costs around $400, depending on your region’s climate and the size of your lawn. The frequency of mowing also impacts on the overall price. An infrequently trimmed lawn will be more difficult to maintain and, therefore, more expensive. To install new hydroseeding grass will cost $0.50-$1.00 per sq.ft. 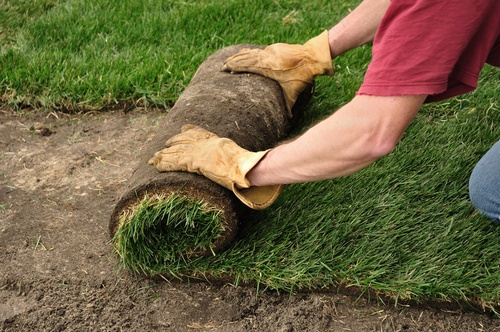 ; to install new sod will cost $3.50 per sq.ft. ; and to install new artificial turf is approximately $8-$12 per sq.ft. How much does it cost to maintain and mow the lawn in my city? Cost to maintain and mow the lawn varies greatly by region (and even by zip code). To get free estimates from local contractors, please indicate yours.